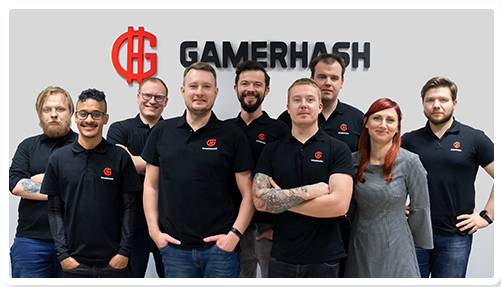 The team behind GamerHash is devoted to bring the best solutions to our community and make blockchain easily accessible to everyone. We are gamers, we are miners, we are IT freaks, we are the GamerHash. Drop us a line at jobs@gamerhash.com ‏‏‎if you want to join our team. GamerHash team comprises developers, security experts, marketing and community specialists who work every day to better the GamerHash ecosystem. Thanks to this, our users can seamlessly become a part of the blockchain technology and most importantly earn funds, hassle-free. The GamerHash brand belongs to CoinAxe sp. z o.o. (limited liability company) located in Poznan, Poland at św. Czesława 7/12, postcode 61-575, entered into the register of businesses maintained by the Poznan, Nowe Miasto and Wilda District Court in Poznań, VIII Commercial Division of the National Court Register under the number 0000702769, Tax Identification Number PL7831767156. ­Need our branding materials ? See this site and download what you need.